i want to be the woman with a clean house all the time. i read this quote once that said tidy house, tidy mind, and i actually have to agree with this. there is nothing quite like sitting down on the couch at the end of the day knowing your entire house is clean. especially if my laptop is charging and acting as a heating pad on my stomach, and i'm eating banana chocolate chip gelato (target has it, you're welcome). i mean, a girl can dream. but i've come to the realization that even when that happens, once a year, the whole house isn't actually clean. i'm not a duster. i leave spilt garlic powder in my cabinets for days. there are definitely five or more dead bugs in my windowsill and, truth be told, it doesn't bother me all that much. i'd say my biggest source of frustration is the laundry. meet the pile. also known as: all of our family's clothes. every couple weeks she comes around and usually lives on our kitchen table from early morning until just before dinner, then moves onto our bed while we eat, and back to the table after dinner is done and cleaned up. it's lovely. and isn't it the absolute best when you find out unexpected guests will be arriving in an hour or two? you clean like you have never, ever, ever cleaned before. you rush and you move like you're running a marathon. you get more done in an hour than you normally get done in a week. for making my house to look put together. for making it look nice, and shiny, and clean, and cute. and the funny thing is, that's just how i want my heart to look too. i want my heart to look like i'm all about Jesus all the time. i want to look like i have the right political views, the right answers to all the hard questions, the outstanding mothering qualities, and that i'm the housewife that does it all. but, really, i'm just grasping, y'all. i'm just thankful that each day is a new day. i'm just trying to learn more about Jesus as i teach my kids about Him. and when they ask the hard questions i am praying that God makes the answer clear to me so i can make it clear to them. most of all, i'm thankful for grace upon grace upon grace. just like my home, my heart's a mess. but Jesus wants it. He wants all of it. the dirty dishes in my life, the cobwebs and dust bunnies in the corners of my heart, and whatever that dang pile is. He wants that, too… if we'll just give it over to Him. AH! I just posted about my messy house yesterday! 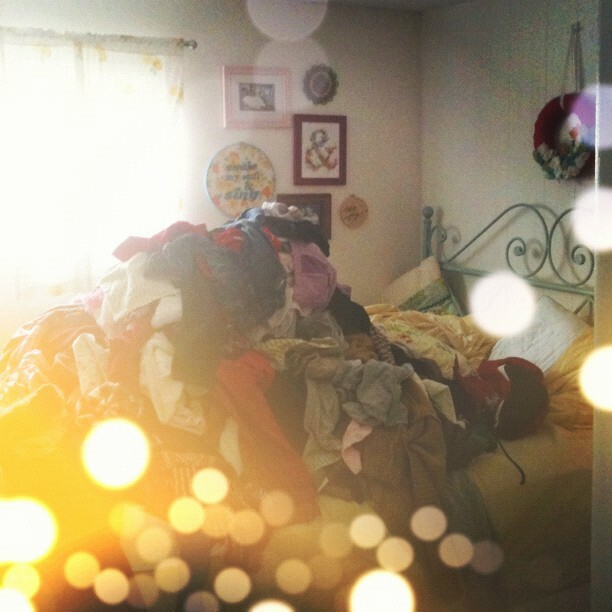 And gah... the laundry pile. Seriously. Nudist colony anyone!? girl. I know that pile. She lives here too. usually on our bedroom floor. next to the window sill with the bugs. but you know...i think she kindof likes it there. :) haha all that said...i could not agree more. I know that He just wants US. ALL of us. even the dirty. Thanks for this sweet post. love you girl. Dust here too sweetie, but the laundry pile was massacred long ago by the load a day rule. Changed. My. Life! I wish I had a super clean and tidy house, but I also wish my boys to be happy and healthy and loved. Guess which one wins! Life would be much easier if laundry would was it's self!! Right?! I love that you clean more all week then when people come over, me too.. me too!! Thanks for this post. i'm so happy i stopped by your blog tonight. i feel like this was a beautiful breathe of honest, fresh air. so thank you for that. You know I've been struggling with this thought for weeks now. Wanting to be shiny and clean inside and out, and when I still got my 'piles' I feel like I failed, but only because I haven't handed them over to Him. Reading this tonight, it made sense. He wants my mess because only He can clean it. Are you reading my mind?? :) Sometimes I sit in church and for whatever reason,I think everyone else has it all together and here I am praying for Jesus to help me be 'good enough'. I don't need to be good enough. I just need His Amazing Grace. And also, I am a lover of laundry. Sorry. Have a fun day. Sing a Christmas song! :) We did already in the car! you are singing my song. i'm glad he want's my junk! Beautifully written! You always have a way of being transparent, bringing a message, and shining God's light through your words, like woah!! oh amen and amen! i just had a few preschool moms in for coffee this morning and i was a total wacko cleaning freak last night. why? because i have issues!!! isn't it sad? LOVE YOU!!!!!!!!!!!!!!! a beautiful post and a good reminder! thank you for this today! Beautiful and so true. Thank you for writing this!! I really like this post Danielle-- such a good reminder. I can relate exactly to this post! I absolutely hate putting away my laundry! Thank you for the encouragement! Another gorgeous post Danielle! I take my hat out to you. We all struggle on our daily basis and to hear that there are more ladies out there with the same struggles is comforting. Thank you for those words. I'm all too familiar with that pile...I can't imagine how you deal, but I suppose you have more little hands to help. Happy folding!